Not all wood is the same. Some types of wood have particular characteristics depending on their geographic provenance and their physical and molecular structure. Listed below are some of the main types of wood used to make a barrel. Allier oak: with a characteristic golden colour and warm rosy reflections, it grows in France in the region of the same name. It is dense and rich in vanilla components and tannins that can guarantee prolonged ageing. Nevers oak: it grows further north of that of Allier (Loire valley, France) and can be considered an excellent alternative. 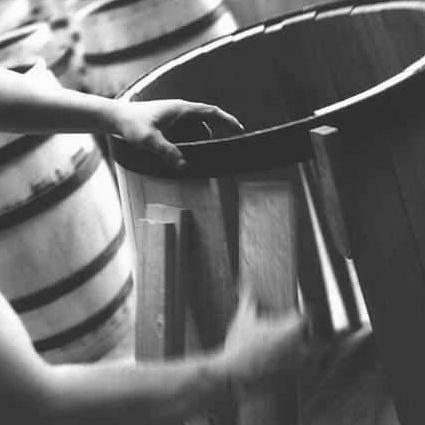 Troncais oak: like the above, it comes from the Loire valley. It belongs to the Allier region, with even more marked characteristics than the previous type. Cher oak: this oak species has characteristics coming between the Allier and Limousin. Limousin oak: it grows not far from the Cognac region and, like Poitou oak, it has coarse porosity that affects the astringency of the distillate. Slavonian oak: less prized than its noble French relatives, it is used mainly used to make large barrels. Chestnut: chestnut wood contains a high quantity of tannins and gives much colour to the distillate. Cherry-wood: this wood can give interesting intense hues, even if it does not give the distillate very particular aromatic notes. Acacia: it gives the distillate a wonderful golden colour with pale green reflections, and fascinating aromatic notes. Juniper: not usable, at least new, for long ageing, due to the distinct and strong aromatic note that does not blend well with the overwhelming flavour of the Grappa. On the other hand, the result is delicious when used with moderation. Almond: this wood gives the distillate a golden colour with intense amber reflections and interesting olfactory and gustatory notes. Ash: even if used rarely in long ageing, it gives little colour to the distillate, but offers refined aromatic notes. Apple: it gives colour but is not very interesting from an aromatic standpoint. Mulberry: it gives the distillate a lovely golden colour with much appreciated soft aromatic notes.